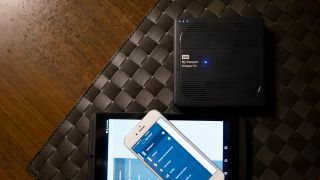 Western Digital is fluffing up its wireless drive offerings with a new My Passport Wireless Pro portable hard drive and My Cloud Pro NAS solution. The earlier is a follow up to Western Digital My Passport Wireless released in 2014. The Pro version brings a redesigned drive with AC Wi-Fi and a new integrated 6,400mAh battery. The storage maker claims users will be able to access the drive for 10 straight hours or use the onboard cells to recharge other devices. As its name suggests, this drive is designed to work completely wirelessly whether you're pairing it with your phone, instantly copying photos from a Wi-Fi enabled camera or editing files directly off the Passport to your computer. Western Digital is also pushing the My Passport Wireless Pro as the perfect, portable Plex server and able to stream HD content to four computers at the same time. It's available now 2TB and 3TB sizes for $229 (about £156, AU$306) and $249 (about £170, AU$333), respectively. While the Passport is designed to be a portable backup and media server solution, the My Cloud Pro is a more serious network attached storage solution. As such, it supports up to 32TB of storage for backing up data stored locally or any external media you plug in. All you need to do is connect your camera, SD card or other media and press a single button to start the importing and backup process. Users can also use the NAS to work on files in real time including 4K video content. The My Cloud Pro begins at $399 (about £272, AU$533) and prices up to $1,649 (about £1,125, AU$2,205) depending on the configuration and capacity you choose.